Yes, I did over simplify things for now. Yes, the pics are for the mac version. I’ll change them as to not confuse anyone but if you notice the screenshots are taken from the tutorial linked to on the winpwn site. For those wanting to try this, first off know that Winpwn and Ipwn(Mac) jailbreak your phones the safest out of all the programs out there, such as Ziphone and ILiberty. Note though that to fully unlock your phone after you have pwned it, than installed custom firmware, you must use installer to place the BootNeuter app on your phone. Than use this app to flash your baseband, unlock and neuter your BL. If you had a 4.6BL that had been downgraded to 3.9 this will allow to go back to 4.6 with no issues. ok you seem pretty knowledgeable. Can you please explain to me what the difference between 3.9 and 4.6 is??? yea sure np. the difference between a 3.9 bl and a 4.6 with bootnueter “the dev teams tool which allows the bootloader to run any firmware” is virtually nothing. although i do know that 3.9 is easier to hack and has been from that start and the 4.6 bl is what was giving so many people trouble when trying to jailbreak 1.1.2 1.1.3 phones ootb. hwoever it has been cracked and provides little or no resistance to hackers these days. lets just say something did happen to my iphone….what would i have to do in order to send it back into apple and have them not know i hacked and unlocked it. Why would the average person like me want to upgrade from 1.1.4 to 2.0? I am not a developer and I really have no use for the SDK. So I am confused, what benefits or differnces will there be? Do I need firmware 2.0 to buy apps from the coming App Store because I expect to see hacks that circumvent App Store, just as there are now “jail breaks” that let users install unsanctioned software onto current iPhones. If anyone can help me, I’m confused. Thnaks. That is correct. You should not upgrade to 2.0 yet. Having firmware 2.0 is illegal unless you are a developer registered with Apple. So it is ILLEGAL? to have 2.0? or just against warranty? I wouldn’t think it illegal to use if they put it out there for everyone to use. I’ve recieved the SDK notifications and all that, but I don’t have an apple to play with it…so I haven’t downloaded it. If I am correct, the 2.0 comes with the SDK, which they published for just about anyone to use. is there any program that can just back up an Iphone? I tried copying everything using WinSCP, but it wouldn’t work. I want to back up all my programs AND all the info I put into them. Even if Winpwn was a full version and backed-up all of my programs, it still might not get all of my to-do lists, sources, categories, etc.. Any suggestions? 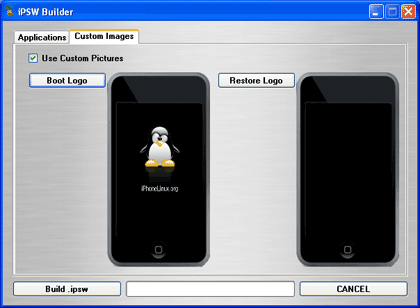 I have the iphonelinux penguin and cant get it off. Apple says my phone has a virus. I used ipwn and now when the phone boots on, all I have is that penguin. Ive tried restoring it, apple has tried restoring it, but nothing. Any suggestions?